The Florida softshell turtle (Apalone ferox) is a freshwater turtle that is native to the Southeastern United States. 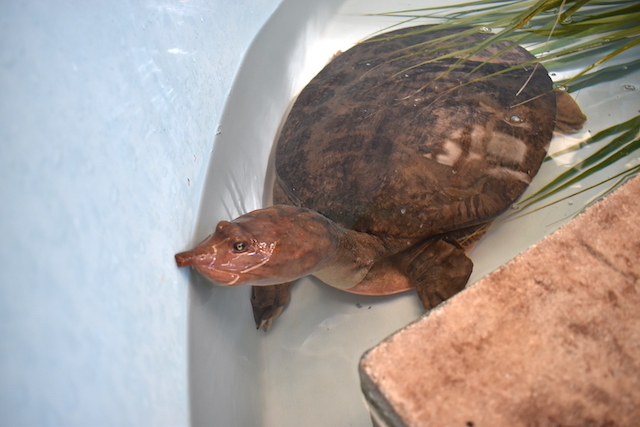 At CROW, an adult female Florida softshell turtle, was admitted from the Shell Point Retirement Community and was reported to be tangled in monofilament fishing line. Upon intake, veterinarians noted two separate strands of monofilament line extruding from the mouth of the turtle. Radiographs were taken and revealed two separate hooks attached to two separate lines within the turtle’s body. 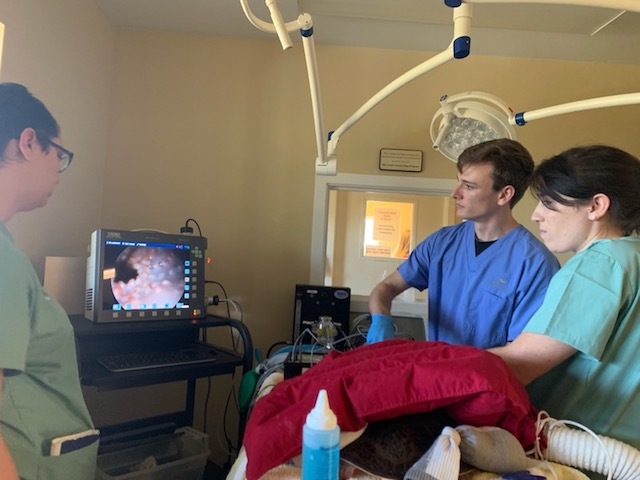 The following day, the patient was anesthetized and veterinarians used an endoscope – an instrument which can be introduced into the body through the oral cavity to give a view of its internal parts using a small camera – to identify the hooks’ locations within the GI tract inside the turtle. While the hook in the turtle’s esophagus was completely removed, only part of the hook in the turtle’s stomach could be surgically removed. The patient is expected to be returned to the wild soon. “The turtle will be released later this week as long as she continues doing well with recovery,” said Dr. Abbott. There were 101 cases for hook and line entanglement reported at CROW in 2018, an increase from the 65 patients that arrived with fishing hooks or monofilament line entanglement in 2017. Not only can the clear, strong, flexible plastic do harm to birds, manatees, turtles, whales, dolphins and rays (to name a few), it also non-biodegradable. Scientists estimate it can take 300 to 500 years to decompose. The rehabilitation clinic is continuously involved in a campaign called with other island organizations such as the City of Sanibel, Sanibel Sea School, Monofilament Busters, SCCF, FWC and “Ding” Darling Wildlife Society. For more information on the Monofilament Recovery and Recycling Program, visit mrrp.myfwc.com/faqs. UPDATE: This patient was successfully returned to the wild on January 28.